The sub-title of this rather beautiful coffee table pictorial book is “Whales Wine Fynbos Art” and it is all that and more. Beth Hunt is the author, with photographic input from Johann and Kobus Kruger, and they have excelled themselves by bringing life to this small Cape town. But actually, Hermanus is not such a small town these days. According to stats within the book, it was established over 150 years ago. After Cape Town, Hermanus is reputed to be the fastest-growing town in the Western Cape. Fascinating facts, and there are plenty more of them in this well-researched book. 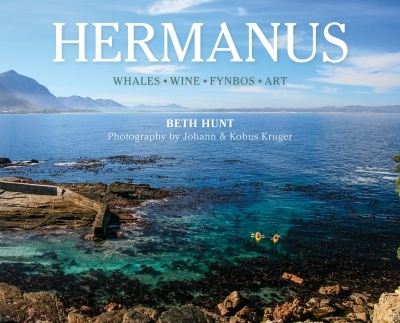 The author states that to understand Hermanus as it is today, it is necessary to turn back the pages of the past. She certainly does this, going as far back as the original San and Khoikhoi people, then through the time of the first settlers, in a very informative but easy-to-read style. The pages are littered with historical illustrations and photographs, all beautifully printed. The main attraction of Hermanus, as far as most people are concerned, is of course the whales that can be seen along the coastline. Walker Bay is one of several breeding sites frequented by southern right whales along the southern Cape coast, and has become one of the most popular whale-watching locations in the world. Apparently, there are over 84 species of dolphins and whale that inhabit the earth’s oceans, of which half are either resident in South Africa’s waters or visit during the year. Hermanus has become known as the “whale-watching capital of the world”, and certainly has to the best site for land-based whale watching. From the cliffs, whales can be spotted as close as five metres offshore. As if this wasn’t enough of a reason to visit Hermanus, there are any number of others. Sharks abound, and the much-feared great whites are a common sight. Cage dives are available for those of an adventurous disposition. The South African Shark Conservancy is situated at the Old Harbour, and provides a fascinating insight into the world of these amazing creatures. As far as the flora of the region is concerned, an estimated 1,500 species of fynbos grow on the slopes of the mountains in the Fernkloof Nature reserve. This indigenous fynbos biome is part of the Cape Floristic Region, one of only six in the world. It is by far the smallest but also the richest in the number of species. The Hermanus Botanical Society offers guided tours to view the proteas, ericas and other fascinating fynbos species that flourish here. Peak flowering time is in Spring (September and October). A large section of the book is devoted to the people of Hermanus and their talents. Over the years it has become an arts and crafts centre, well-known for its quaint, old-fashioned shops and outlets, filled with anything and everything. You’re bound to find what you’re looking for in terms of décor items for your home, plus an awful lot more that you weren’t expecting!